Officials with the Southwest Ohio Regional Transit Authority (SORTA) are looking for public input about how to improve the region’s Metro bus system. The feedback is being solicited in order to update the organization’s plan which was last completed in 2008. Since the last transit plan was completed, SORTA officials tout the completion of several major items include new articulated buses, hybrid buses, Uptown and Western Hills transit centers, GoogleTransit interface, payment technologies, Google Transit interface and a revamped website. An articulated bus picks up passengers at Government Square. Photograph by Randy A. Simes for UrbanCincy. With those initiatives now in place, the transit authority is looking to do more. 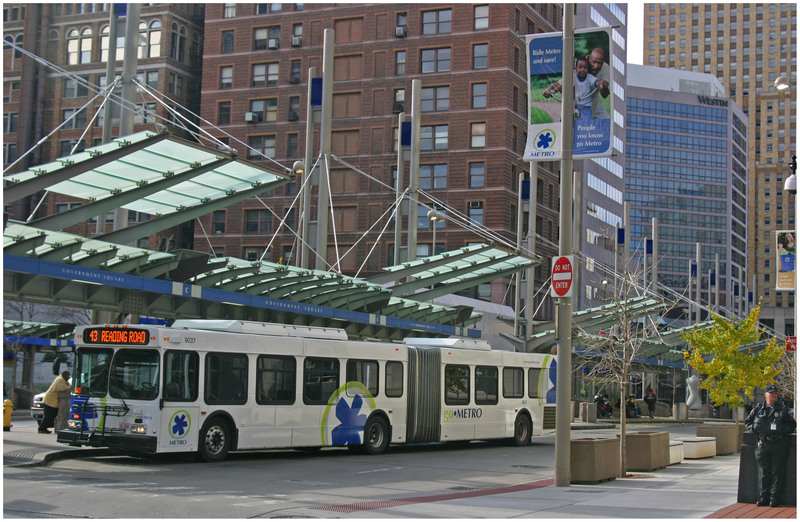 In an online survey, available now through August 2012, officials ask what could be improved about existing service and what kinds of new service would add value to the regional bus network. The survey also asks whether amenity upgrades like bus shelters, benches, and real-time arrival at busy stops would be of value. The public input gathered, officials say, will help develop a new transit plan that will be released at the end of 2012. Those unable to attend the public meetings can expect a video to be posted online in the coming weeks that will summarize the key points of the public presentations. Additional public meetings will then be scheduled in the fall as the final plan is rolled out to the public. Officials also emphasize that every person who completes a survey will be entered to win a 30-day rolling Metro pass, with winners being announced in early September.